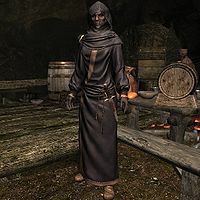 Dravynea the Stoneweaver is a Dunmer elemental mage living in Kynesgrove. She is responsible for maintaining a low temperature in Steamscorch Mine so that the workers are able to continue mining. After raising her disposition, she becomes a potential candidate for marriage. She is the expert trainer in Alteration. Dravynea dedicates much of her day to working inside the mine. She wakes up at 6am and takes a one-hour breakfast inside the Braidwood Inn. She will then wander about for the next four hours, dividing her time between relaxing inside the inn or wandering about the campsite area set up outside the mine. At 10am, she heads inside the mine where she will spend her time wandering through the tunnels of the mine, making sure that none of them are ready to collapse. After five hours of being inside the mine, she leaves at 3pm to resume her routine of wandering around the Braidwood Inn and the campsite area outside the mine. At 5pm, she finds a seat inside the inn to take a one-hour dinner. After her meal, she will wander about until 8pm, when she heads back to the mine. She will spend three hours working inside the mine, this time mining the ore inside the mine. At 11pm, she leaves the mine to wander around for three more hours until she heads to her bed inside the inn at 2am. Dravynea wears blue mage robes and a pair of boots. She wields an iron dagger and carries a selection of common loot and gold. When you first approach her, Dravynea will tell you that there is nothing of interest to see in Kynesgrove: "An outsider? No reason to stop in Kynesgrove. Keep moving." She will then tell you about the work she does in the mine: "The mine's always on the verge of collapse. Good thing I'm around to keep it up." She may also provide you with her opinion of her homeland: "Morrowind used to be a lovely place, but you couldn't pay me to live there these days." She will then discuss the poor treatment Dunmer receive in Skyrim, but will mention that Roggi Knot-Beard treats her fairly: "Most people in Skyrim don't care for Dunmer. Roggi's the only one around here even half-decent." She will also express her interest in seeing how the Dunmer refugees in Windhelm are faring: "I should get over to Windhelm more. See how the other Morrowind refugees are getting along." You can ask her where you can learn more about magic, which will have her point you toward the College of Winterhold: "Not here. Definitely not here. You want to learn, join the College in Winterhold. They'll deal with it." You can also ask Dravynea about what she does in Kynesgrove, to which she will tell you about how she uses her magical abilities to keep the tunnels inside the mine safe: "Nosy one, huh? I was a mage back in Morrowind. I lend my talents to the mines here, helping them keep the tunnels safe. By Azura, it gets hot in there. I use Frost Salts for a potion to keep the heat bearable, but I'm out." You can tell her that you are sorry to hear that, to which she will reply: "It's not any of your bother, so I don't see what you're apologizing for." If you instead choose to tell her that you can find some frost salts for her, she will accept your help and offer some training as a reward: "If you want to go to the trouble, feel free. I suppose I could offer you a bit of free Alteration training when you get back." When you return to her with some frost salts, she will be surprised but happy to see that you completed her errand and will respond: "Well, well, you actually did what you said you were going to do. I'm impressed. Here, let me teach you a thing or two about Alteration magic. It's the least I can do." Roggi Knot-Beard will occasionally mention Dravynea, claiming that she keeps the mine running: "Working our mine is dangerous work, but Dravynea keeps it going. Well, Dravynea and the promise of more mead." Kjeld: "Roggi tell you about the scorcher we found under the scaffolding?" Dravynea: "Again? But there shouldn't be any earthstreams over there." Kjeld: "Well I nearly lost my eyebrows to it." Dravynea: "All right, I'll take a look at it." Dravynea: "What did I tell you about snooping around my wards?" Kjeld: "Woman, there's a vein of malachite as thick as my leg back there." Dravynea: "And if you don't let me secure the steam channel, your leg could get blown off. So go dig at the other corner for a bit." Kjeld: "Well... just get it done." Kjeld: "Is the new shaft cleared yet?" Dravynea: "No, I've been busy trying to keep the whole mine from collapsing, if that's all right with you." Kjeld: "You're busy. I'll come back later." Roggi: "Kjeld bothering you again?" Dravynea: "Nothing I can't handle." Roggi: "Well, you send that blowhard to me if he steps over the line." Roggi: "How's the mine today?" Dravynea: "Not too bad. Careful around the more obvious scorchers." Roggi: "As usual. I've always got an eye on the rocks." Interestingly, despite being a mage, Dravynea is not able to use any spells. This issue has been addressed by version 2.0.7 of the Unofficial Skyrim Patch; she will use spells when in combat. Dravynea was supposed to be the backup vendor for Wuunferth the Unliving if he died, but the vendor data was not set up correctly. The quest Dravynea's Frost Salts appears to reset every two days, thus permitting free Alteration skill boosts.